Perfect for working directly with a PV panel. 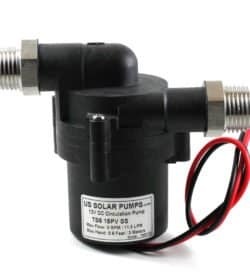 The D5 Solar Hot Water Pump has a soft start-up feature which reduces high in-rush current. When the photovoltaic panel provides sufficient power, the pump goes through the alignment phase by turning the rotor into the position required for start-up. The processor then waits until the capacitor is sufficiently charged. This enables a start-up with minimal power (less than two watts). This process minimizes cycling due to unsuccessful attempts to connect. Even after prolonged shutdown, the pump will start reliably. For solar system loops, the D5 Solar Hot Water Pump powers directly from a PV panel. The sun comes up, heat builds in the solar hot water panel producing electricity in the PV panel. The pump slowly starts with the smallest amount of current and pushes the heated water to the storage tank. This simple system eliminates the need for controllers, thermostats and sensors. High efficient ECM brushless DC motor can sustain a continuous 24-hour workload with life expectancy of well over 20,000 hours. When drive circuitry detects no or little liquid in the pump chamber, it will stop the pump to prevent damage. 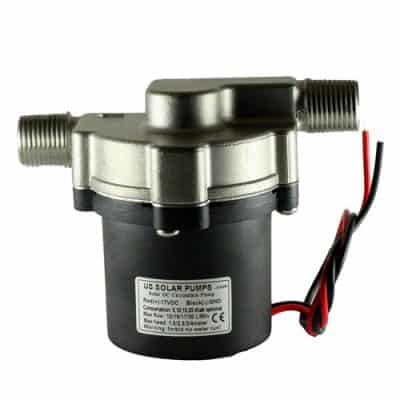 Then you can restart the D5 Solar Hot Water Pump manually by disconnecting and reconnecting it to the power supply. 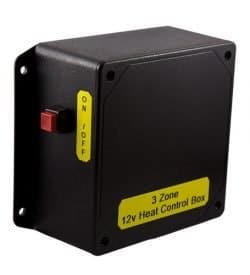 If the voltage exceeds 28V, the pump will auto-protect and shut off the power supply. When the voltage falls below 28V, the pump will restart automatically. When the current exceeds the rated current, such as can arise when the impeller jams due to debris, the pump will automatically stop to prevent damage. The pump will restart when the current returns to normal. Also, take a look at our other popular pumps. The C7 Circulating Pump and the C8 Circulating Pump are good choices.